First, find the Community button in the side panel. Its appearance changes depending on the current Treasure Hunter event that is running. 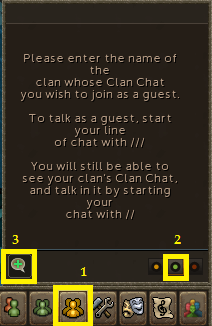 Hover your mouse over this icon, and you will see the Clan Chat icon. Click on it! You will see a panel like the following show up on your screen. In the bottom right of the panel, click the green center button. The speech bubble button on the bottom left will appear. Click it! 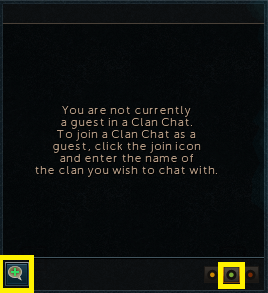 Welcome to the clan chat! You can talk to us by pressing three slashes prior to your message. ///Like this! First, click on the Clan icon in the main panel. (1). Then, click on the green middle button in the bottom right hand corner of the interface. (2). Then, click on the speech bubble icon in the bottom left corner of the interface. (3).